Note: Called a "steam schooner." Astonished vesselmen by running Toronto to Quebec in 3 days. 1843, Sep 7 Arrival Quebec from Toronto, first vessel making this trip, thereby opening to vessels of her class navigation from the sea to Chicago, IL. 1844 Owned Toronto & St. Lawrence Steam Navigation Co.
1847, Dec 8 Capt. 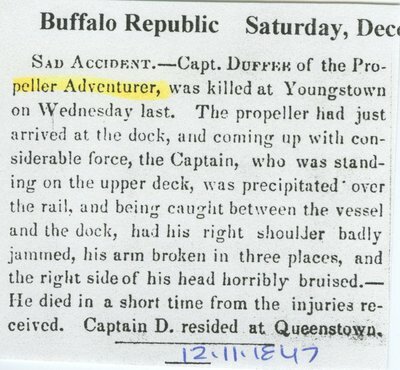 Duffee (of ADVENTURE) crushed to death by her between her and dock, Youngstown, NY, Niagara River. 1848 Owned Colcleugh & Greer. 1849 Owned Glassford & Jones, Montreal, QUE. 1851, Jun 21 Owned William Anglin, Kingston, ONT.